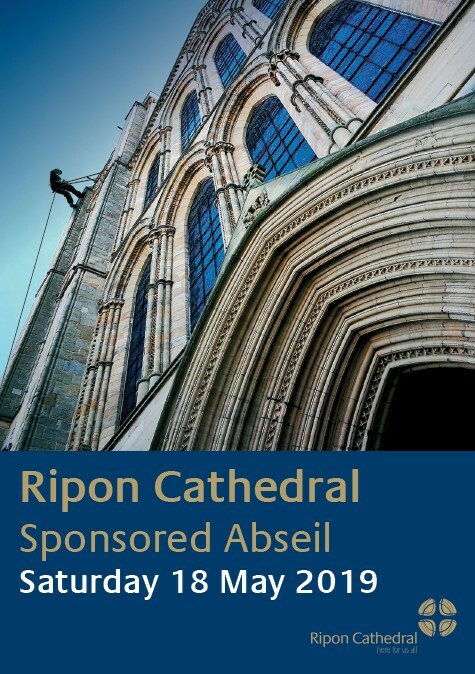 Conquer your fear of heights, raise money for a good cause… or do it simply because it’s fun… on May 18 there’s a unique opportunity to descend more than 100 feet in a sponsored abseil from Ripon Cathedral’s south west tower. There is a strict limit of 96 people who will be allowed to take part in the event. Each will commit to raising at least £200 in sponsorship to support the development plans for the cathedral. The event is being supervised by Carnegie Great Outdoors, part of Leeds Beckett University, which specialises in providing experiences that combine adventure with education. They have carried out a risk assessment of the cathedral and will provide instructors as well as the ropes and equipment for the 115 foot descent. There will be two lines of ropes for the abseilers who will be cheered on by friends and family in a spectators’ area outside the cathedral. If you are 13 or over, you can book your place for £22.50p which includes fundraising ideas to help you start your sponsorship. You will also receive a medal after you have completed the challenge. The first person to book their place was Cathie Dance whose late husband Alan was sub-organist at the cathedral from 1963 to 1974 and whose sons Alex and Piers were both choristers at the cathedral. Amongst others taking advantage of this brilliant opportunity are Alanah Honey from Kent who works with the cathedral’s architect, Oliver Caroe; Canon Michael Gisbourne’s daughter Laura and a team of four from estate agents Linley and Simpson.